There is one other kind of primate that people may not be aware of, the Prosimainssometimes they are referred to as “pre-monkeys“. There name means “before monkeys”Prosimians are a type of primate that include galagos, pottos, lemurs, lorises, bushbabies, and tarsiers, but not monkeys, apes, or humans (simians).. They are the ancestors to monkeys, and apes and live a very different lifestyle and with characteristics that are more “primitive” than those of monkeys, apes and human. The various groups of prosimians have specific ranges: lemurs are endemic to Madagascar, lorises inhabit Asia, galagos and pottos live in Africa. 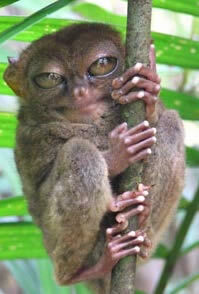 With the exception of the tarsiers, all extant prosimians are in the suborder Strepsirrhini. Because tarsiers, as well as some extinct prosimians, share a more recent common ancestor with monkeys and apes than with other prosimians, the prosimian are a paraphyletic group and not a clade. Prosimans have a black snout and a well-developed sense of smell (for a primate). Their narrow black snouts support a moist and finely sensitive nose. They have large eyes and special adaptations of the retina that enhance their night vision. their eyes have a tapetum lucidum a reflective layer behind the retina that captures stray light and enhances their vision at night. This catlike visual ability, together with their heavy reliance on scent, parallels the nocturnal lifestyle of the original primates, and perhaps unfairly paints the prosimians as primate relics or living fossils. Prosimans have a long tail that serves as a counter balance when moving and jumping. Prosimians are quadrapedal and are agile when in the trees, capable of running and leaping amongst the branches. Prosimians produce a variety of calls. Lemurs, for example, use calls to signal threats and to communicate between members of their group. Indri maintain territories with loud wailing calls and sifakas declare their territories using “shi-fak” calls. About three-quarters of all prosimians are nocturla. Their retina contains a shiny reflective layer known as a tapetum which enhances their night vision. Noctural prosimians also have sensitive hearing. Unlike other primates, prosimians reproduce during a distinct breeding season (other primates breed based on an individual cycle). Almost all prosimians have comb-like projections on their lower front teeth,a cluster of incisors and canine teeth . They also share a specialized grooming toilet claw, a claw on the second toe of each hind foot that is used for grooming. Most species are tree-dwelling animals and the anatomy of their hands and feet reflect this. Although they are good at grasping branches, they lack the highly developed dexterety of monkeys and apes. Lemurs (which include the aye-aye, sifakas, and the indri) have a long body and large ears. They also have long limbs, and a long busy tail. Lemurs are medium to large-sized primates and are highly social, forming groups of as many as 30 individuals. Lorises, pottos and galagos have dense, wooly fur and are smaller than lemurs. they have large eyes that face foward. They have smallears and opposable thumbs. They have short tails and in some species, there is no tail at all. Unlike many prosimians, lorises are diurnal (active during the day). Lorises feed on insects, fruit, sap and even birds’ eggs. Galagos (also known as bush babies or ngapies) are small and nocturnal. They have good night vision and good hearing. Galagos are well suited for jumping and are know to jump up to 2 meters vertically. The potto (also know as Bosman’s potto) is the only species in its group. They are small primates that weigh less than 1.5 kilograms. They have dense wooly fur and inhabit the rainforests of tropical Africa. A well developed sense of smell, and a more prominent snout. Partial binocular vision (using two eyes together, as apes and monkeys do). Often nocturnal vision. Some claws and developed manual dexterity. Prosimians only live in the ‘Old World’. (area that don’t include North and South America): Lemurs live only on the island of Madagascar, Tarsiers live on the islands of the Philippines, Borneo, Celebes Islands, and Sumatra, and Lorises live in areas of Africa and South/Southeast Asia . Although today’s species are by no means primitive or unchanged, modern prosimians retain many of the physical features that were common to the earliest true primates. The typical prosimian skull has large eye sockets, a relatively small braincase, an elongated snout and adaptations for well-developed senses of hearing and smell.